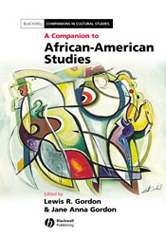 A Companion to African-American Studies is an exciting and comprehensive re-appraisal of the history and future of African American studies. Contains original essays by expert contributors in the field of African-American Studies Creates a groundbreaking re-appraisal of the history and future of the field. - Includes a series of reflections from those who established African American Studies as a bona fide academic discipline. - Captures the dynamic interaction of African American Studies with other fields of inquiry.